Dà Hóng Páo (大红袍) is a very important Wuyi Red tea. Legend has it that the mother of a Ming Dynasty emperor was cured of an illness by a certain tea, and that emperor sent great red robes to clothe the four bushes from which that tea originated. 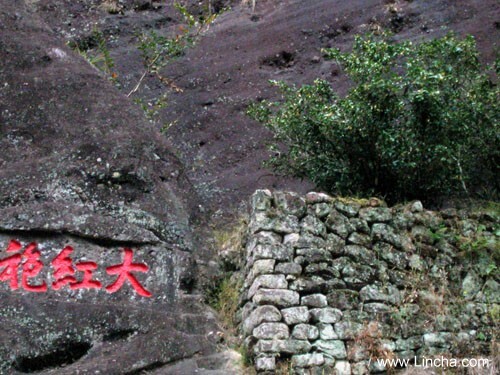 Three of these original bushes, growing on a rock on Mount Wuyi and reportedly dating to the Song Dynasty, still survive today and are highly venerated. At one point, less than one kilogram of tea was harvested from these plants each year, of which a portion was retained by the Chinese government. In 2005, the remainder of this original and real Da Hong Pao was auctioned, with an initial asking price of 4000 RMB/100 g, but often reaching millions of dollars per kilogram. In recent years, companies such as Silk Road Teas, however, have invested in preserving the interest in this and other so-called "artisan" teas which typically are of very high quality and have rich histories as is true with Da Hong Pao. These have an initially high cost to produce (and typically are only considered authentic when grown in their place of origin), but, as they have quickly become popular in Western countries, prized selections of the tea are available each year, with quality being very consistent thanks to the increased popularity of tea. Cuttings taken from the original plants have been used to produce similar grades of tea from genetically identical plants. Taste variations produced by processing, differences in the soil, and location of these later generation plants is used to grade the quality of various Da Hong Pao teas. Some online tea shops have marketed Da Hong Pao as an oolong–it is unclear whether their varieties are not fully fermented as traditional Da Hong Pao tea is or they have errors on their sites. As it’s of very high quality, the Da Hong Pao is usually reserved for honored guests in China.